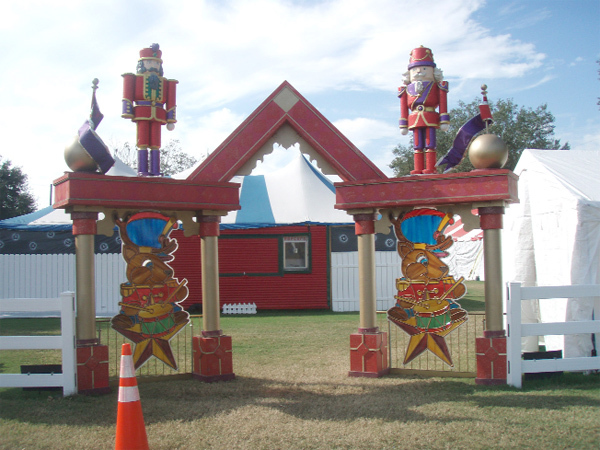 he entrance of Christmas Lane, located in Dover. It will be open from Thursday, December 1- Wednesday, December 28. The most silent of nights and the most holiest of nights comes to us by way of Dover. Once again, Wetherington Lane holds a live reenactment of the true meaning of Christmas. As a young boy, in his teens, Wetherington became starry eyed with nights filled with the glistening of gleaming lights of Christmas and, thus, Christmas Lane was born. Wetherington Lane will be from opened from Thursday, December 1, through Wednesday, December 28, from 6-10 p.m. nightly, including Sundays. Entry and parking is free to everyone. The address is 2015 Wooten Rd. in Dover. Santa Claus will fly in nightly starting Friday, December 16, with round trips until Friday, December 23, from 6-8 p.m. The jolly old fellow will make a special appearance on Saturday, December 24, Christmas Eve night, from 6-7 p.m. Farming is another one of Wetherington’s passions; he has been a farmer for more than 30 years. A new stage was built this year for the nightly entertainment of choirs, solos and other various Christmas induced entertainment. Barrington Oaks, located off of Lumsden Rd. in between Bryan and John Moore roads, consists of 51 homes, most of which decorate for the holidays. Decorations range from blowups to nativity scenes and more. Gates to the community open daily at 6 p.m. and stay open until 11 p.m., except on Christmas Eve and Christmas, where the lights stay on until 12:30 p.m.
Brandon Forest is located on Parsons Ave. (north of E. Windhorst Rd. ), and is also decorated with sparkling and beautiful Christmas decorations for all to enjoy and see. Everyone who visits the Forest during the holiday season receives a kind Christmas greeting from our elves, a special Christmas gift of candy and gets to see our award-winning Christmas decorations.